So many times you see all the posts about the New Year, people being ready to be done with the old one. So eager to move forward into the new, the blank slate. Everyone looking for another chance to get it right, to change it up, but the New Year is really a continuation of a bigger journey that we are all on. We all move forward with a little more wisdom, some well meaning intentions and a lot of love. I wanted this post to be a chance for me to reflect and to celebrate what an incredible year 2018 was. Sure, when I was in the thick of it there were days I was so done, so tired and not sure which was was up, but I made it through and learned so much along the way this year. 2018 was my second full year of planning and boy did it deliver! I saw over 100% growth from 2017, which exceeded my goal for the number of events booked. I also saw a bit of a shift in my clientele as well, finding that more people that truly felt like “my people” entered into my circle. One amazing thing I have noticed this year too is that the majority of my bookings are still coming from referrals, which makes my heart happy. Knowing that people you have worked with within the industry, couples that booked me or their families/close friends are able to confidently recommend you is an incredible feeling. Knowing that sometimes when the days were long, they were worth every second of energy. 2018 started out with my first venture as a vendor in the Wonderful Wedding Show. I had taken part in the show as a venue coordinator previously, so I had a really good idea of what the chaos would be like , but it was so different when it was my business and my booth. So many moments of second guessing my design ideas, right to the end. I honestly wasn’t sure that I even liked my booth until I saw the photos Casey Nolin Photography sent me on Friday night before the show started. I also took on a table scape design for the Inn at the Forks booth which had a very different feel than mine, so it was fun to play around with. This design was meant to reflect the style of their restaurant SMITH. My next venture was two back to back photo shoots - the first with Local Love. 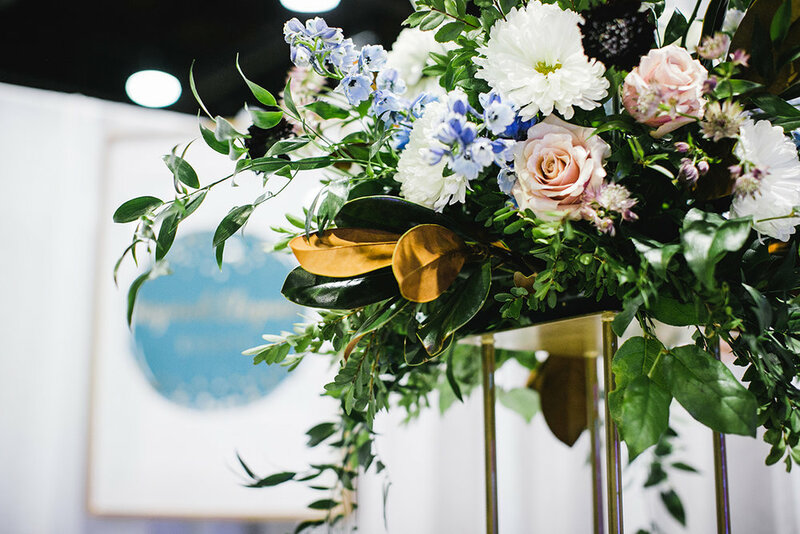 Local Love is a smaller, boutique style wedding show that started in Edmonton and has been breaking into Winnipeg. I really love the idea of shows that feel more personal, more intimate and less overwhelming for clients. Reunited with my one of my faves - Casey Nolin Photography and a great group of vendors we did an indoor photo shoot at The Gates on Roblin. The next photo shoot, taking place in February couldn't have been more different in every aspect. When Bond from BLF Studios reached out, I won’t lie, I squealed like a teenage girl. I have known Bond and his wife Leah from BLF Studios since my venue days at the Winnipeg Art Gallery. They blew me away with their style, but also by how genuine they are as individuals. BLF Studios is a fine art photography studio and I love everything they do. I love how you can look through their entire site and every single photo is unique to each event, each client and their story. Bond had this great moody inspiration that had a really old world feel that I instantly fell in love with. 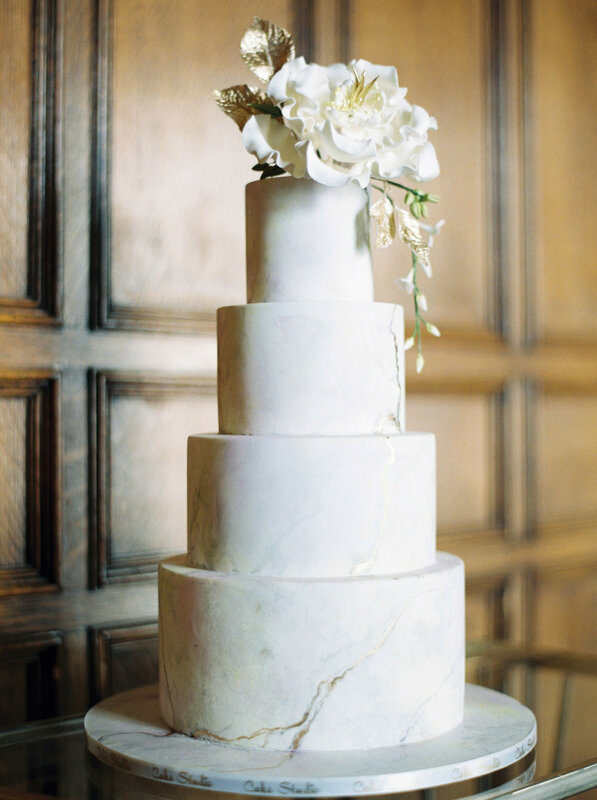 It was so exciting to create something that wasn’t about traditional and bridal, but about beauty and detail. I think we created some magic, but I could be biased. 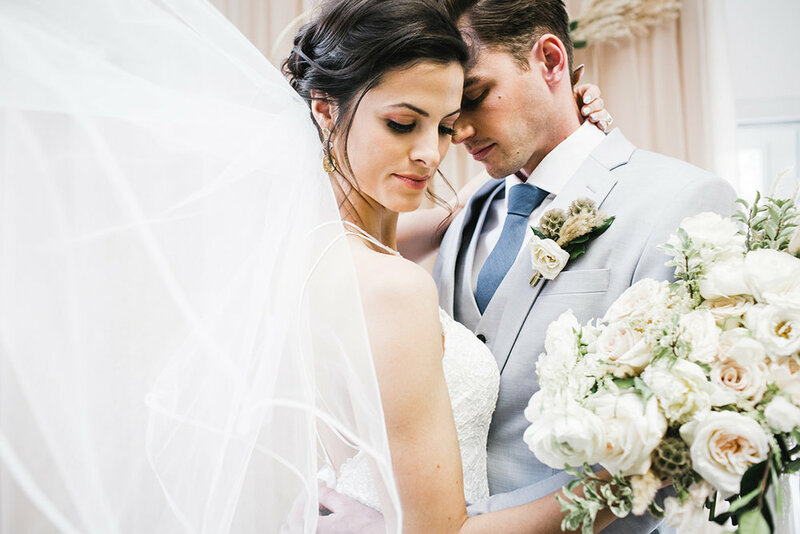 The shoot was published on Once Wed too, which is a favourite wedding blog, so that was a really incredible way to start off 2018. In March I got the opportunity to present to some of the hospitality students at Red River about event planning and what that looks like from both sides - as an independent coordinator and as a former venue coordinator. Sometimes it blows me away that I get to do stuff like this, but after 11 plus years in the industry I do know what I am talking about! Right before Casey jetted off to get married in Ireland, we figured we’d put something together quickly to try and capture some spring inspiration before wedding season hit full force. Our Mediterranean Inspired Love Story photo shoot came together quickly and boy did we have our day of challenges! Shooting in early May, outside in Winnipeg is always hit or miss. Well, shooting outside in Winnipeg in general can be hit or miss. The day started out beautifully, blue sky, a hint of sun. Once we were nearly set up, the wind picked up. It was picking up the tableware and flinging it around. 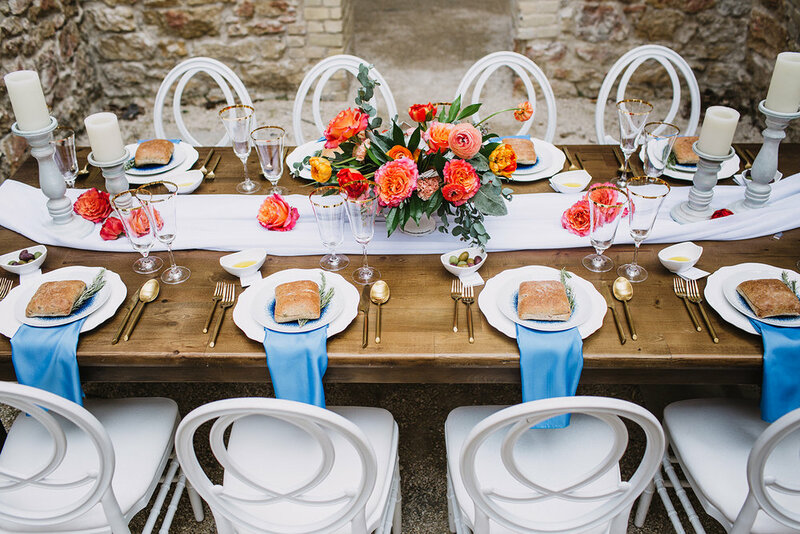 Lauren from Stone House Creative had to reattach her ceremony greens, there were olives flying out of the bowls and bread literally tossed across the table. Our poor bridal models were freezing! We ended up unsetting the table and moving it into a little alcove to try and limit the wind, the results were perfect. 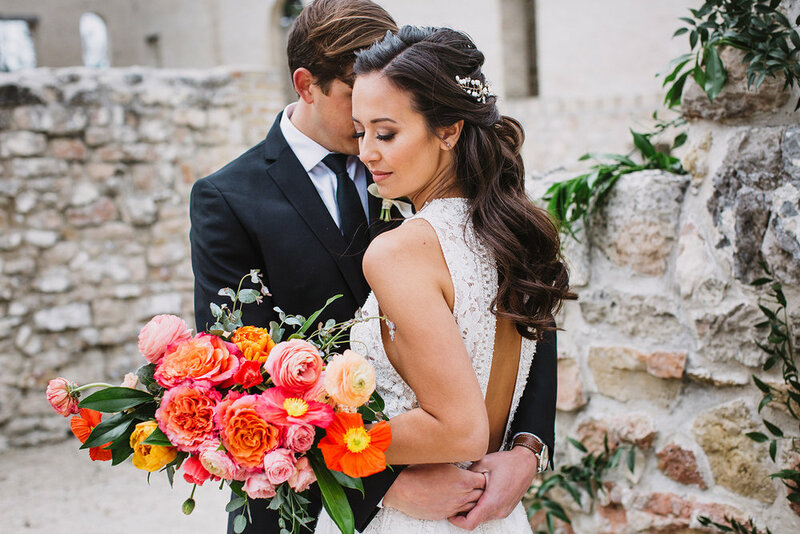 This shoot features a color palette that isn’t very traditional feeling, but it’s for those brides that aren’t afraid of bold, bright colours. 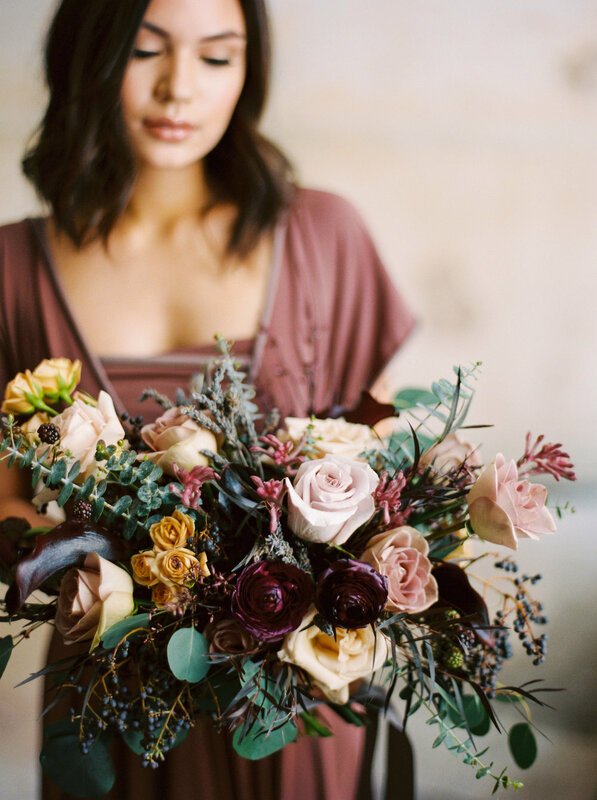 To top it off this shoot was featured on The Perfect Palette - the must read blog for all wedding color inspiration! After this photo shoot the two organizations that I volunteer with had their events and then wedding season settled in and things got crazy. In 2018 I produced 21 different weddings/events. I met some new incredible vendors, got to coordinator in some venues that were new to me. There are so many highlights!! 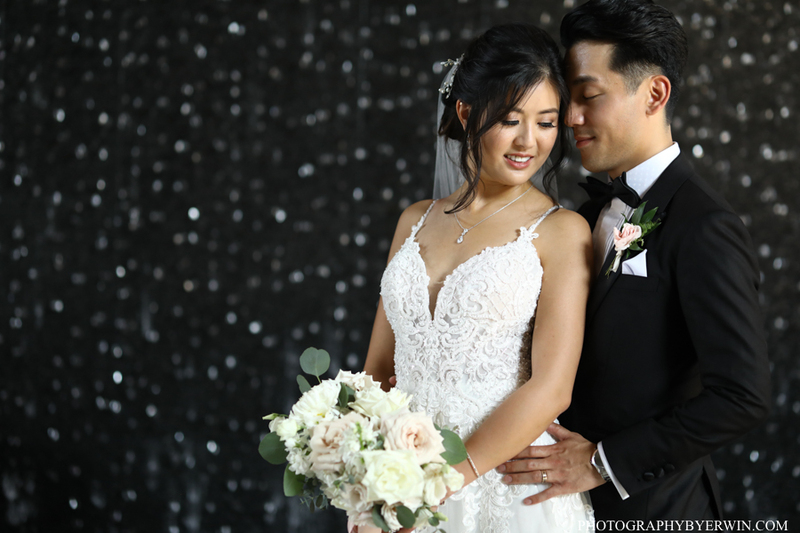 I kick started the season with Liane and Jaydee’s beautiful enchanted garden style wedding at Pineridge Hollow. These two are some of the kindest and most thoughtful people I have ever met. They were incredible clients to be blessed with. 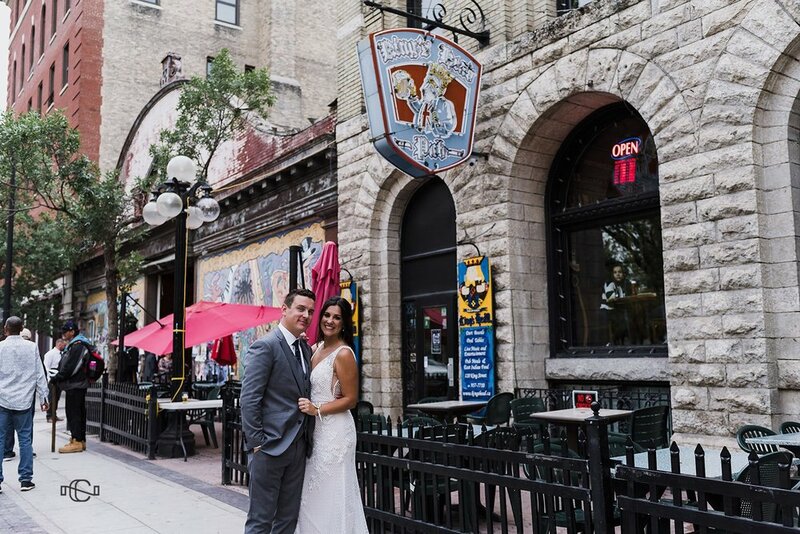 Or Jocelyn and Eric’s tear jerker of a wedding day at the Manitoba Club. 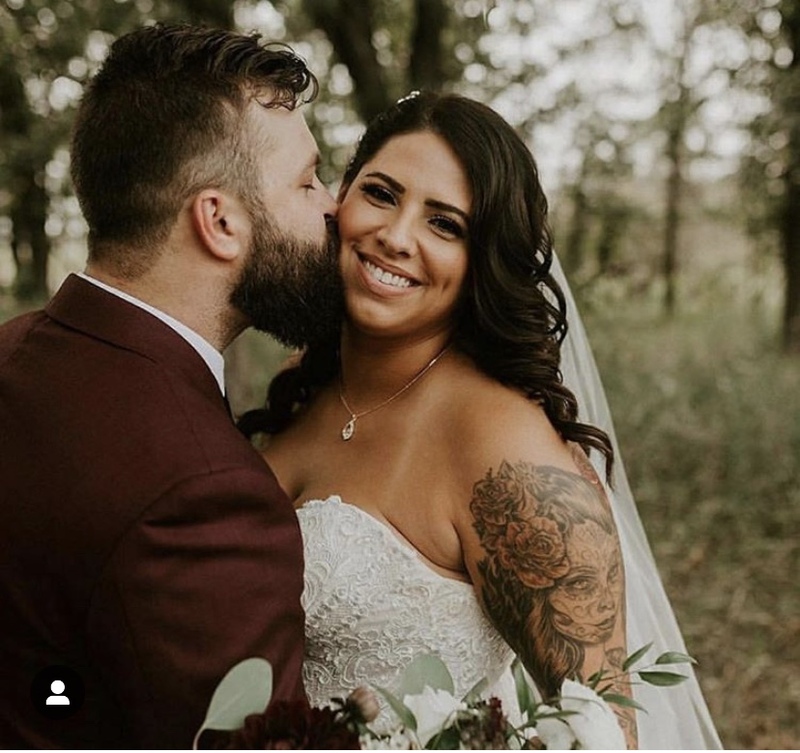 I honestly don’t know if I have ever cried so much at a client’s wedding as I did for these two. They have such a beautiful love story. Jessie and Alastair and Nikita and Matthew got married on the hottest weekend in July and both weddings had substantial outdoor components. I am not sure who wins for being the most relaxed couple of the two though. It was so beautiful to witness them fully enjoying the day and all the people that surrounded them. August was the busiest month of the year for me with 5 weddings in a row which started out an 8 week run of 9 weddings that took me to the end of September. I will say it again and again, THANK YOU. My couples were the best and I so appreciate the love and support I got from my family during this time. I also got to share space with some beautiful families too. They don’t get more gorgeous than these faces. September was a whirlwind. My girls went back to school - Chaya to grade five and Tierney into grade one. Last year I had been very ready for Tierney to be in kindergarten, but there is something about grade one that is just so final feeling. I will admit there was some tears shed. I had four weddings in September and a 16th birthday party on the go. I will give a quick shout out to my sister here as she spearheaded Chaya’s 10th birthday party - without her there may not have been a party. Two of my September weddings though were very close to my heart as both were for close friends. The first was for Casey Nolin of Casey Nolin Photography. She and Glen had taken off in the spring and had their dream wedding in Ireland. They decided to have a local reception to celebrate with those who weren’t able to join them in Ireland. What a blast! They chose the King’s Head Pub as their venue and also incorporated traditional Irish dancers, a romantic serenade surprise by Glen and The Dust Rhinos. I also had the joy in celebrating with my dear friend Chloe and her now husband Ian. I am looking forward to blogging a bit more about her wedding and all the love that went into the day. Chloe and I have been friends for about 17 years, which seems so crazy. They had an intimate wedding with their closest family and friends. They also had the most amazing wedding food ever provided by Denise et Jean-Louis Catering. Chloe let me take the reins when it came to a lot of event design details which was so fun! 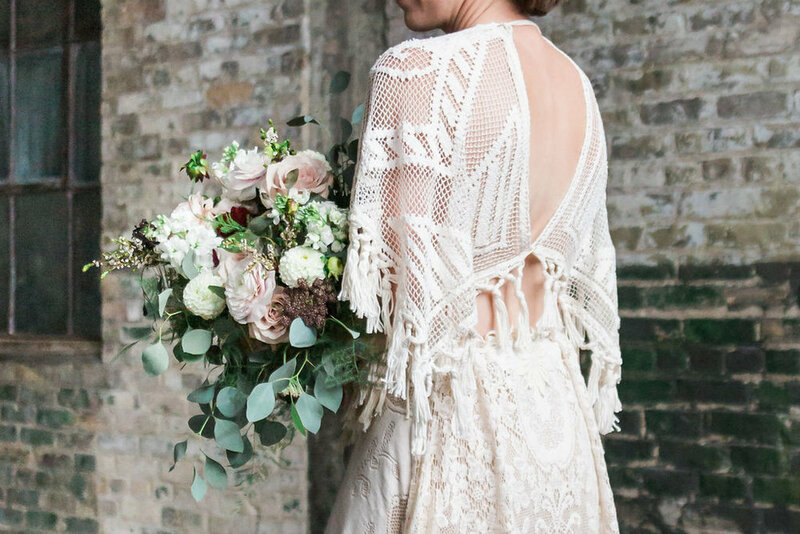 Chloe made a stunning bride and this Reclamation Design Company dress is jaw dropping. I capped the season off with a beautiful wedding that melded traditions from two cultures in a venue I had been dreaming of coordinating in - The Canadian Museum for Human Rights. Working with Ashley and Aly I got to work with an incredible design idea, but also work on custom dinner menus and wine pairings, which for anyone that knows me, well, they’ll get it. Totally my geek. This post has ended up being so much longer than I anticipated and so much more incredible than I had really thought it would be. Here I am sitting on my couch saying thank you to 2018 for it’s challenges and all the beauty you brought my way. I can’t help but be excited to see where 2019 takes me, but from here it feels like 2018 might be hard to top. I am not going to lie, I struggle with blogging. A lot. Which is weird, as anyone who has known me for a long time, know that I have actually had travel articles published, won writing awards in school and honestly thought that somewhere down the road I would have some sort of writing career. Fast forward twenty years and here we are. Blog struggles. I usually start the blog piece and then quickly put it off and push it so far to the side that I only feel a little guilty about not finishing it. Plus there is the unanswered question - does anyone actually read this? This shoot took a lot to come together, it was a struggle. It almost felt cursed. We had models drop out, dress shops change their mind, a suit that didn’t materialize. It was so stressful, but the end product feels magical. Maybe it’s because we did put so much work into making it happen? I couldn’t have done with without the support and work of Casey Nolin Photography - not just for the gorgeous photos but for the late night texts and her unwavering positivity that this would come together. There may have also been wine? The idea for this shoot started with the idea for this table. 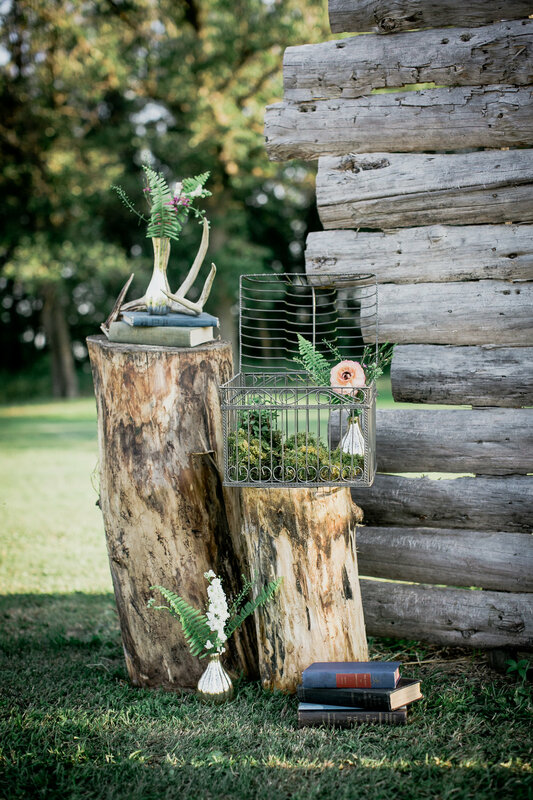 I was dreaming of a table that felt like it was on the forest floor - moss, succulents, ferns and a real wild energy. I think when I described it to Gloria at Beyond Flowers, the florist that collaborated, I said “I want it to look like the Earth is swallowing the table”. 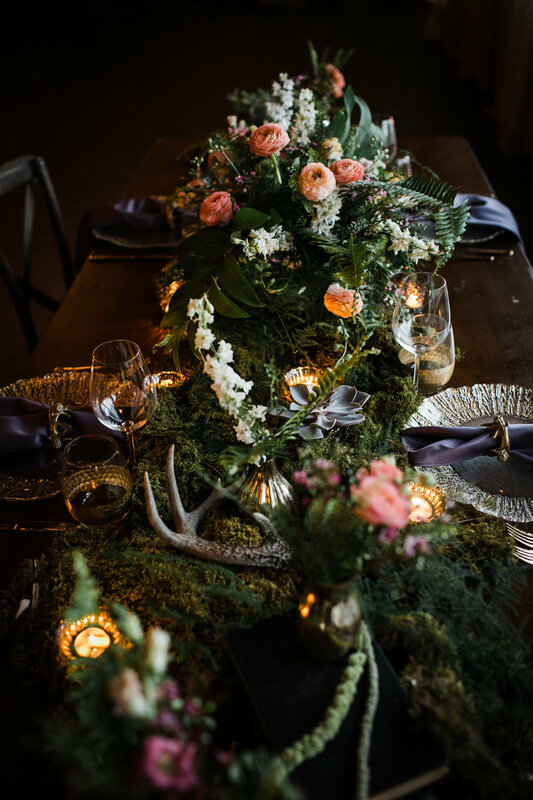 I layered a moss runner with real moss, succulents, antlers and these really incredible local flowers that Beyond Flowers sourced. 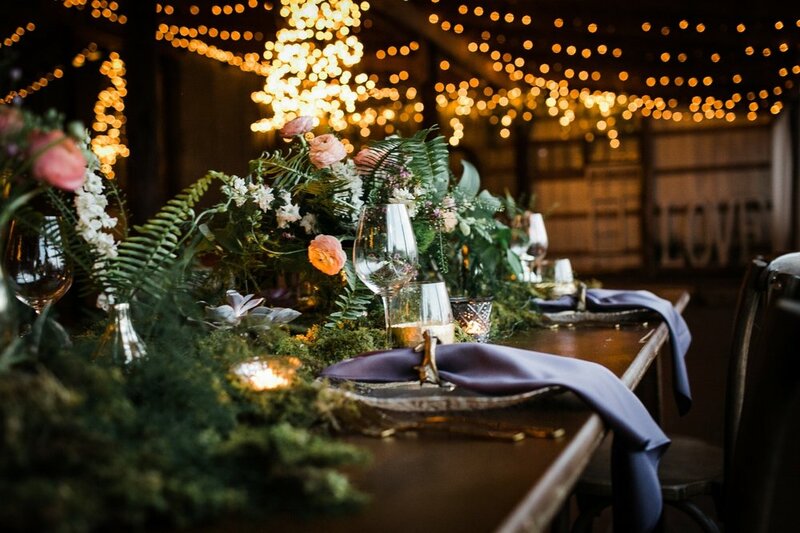 It fit into the beautiful venue, La Lune so perfectly with Dianne’s greenery dripping chandeliers and fairy lights. The chargers had a lily pad feel to them which I instantly loved and the mercury tea lights felt like floating flowers on the table. This table is still hands down one of my favourite pieces. When it came to the dress Anna Lang Bridal came to the rescue. Originally we had a different idea for the dress but Casey and I fell in love with the whimsical feel of this ballgown that had appliqué flower petals attached. 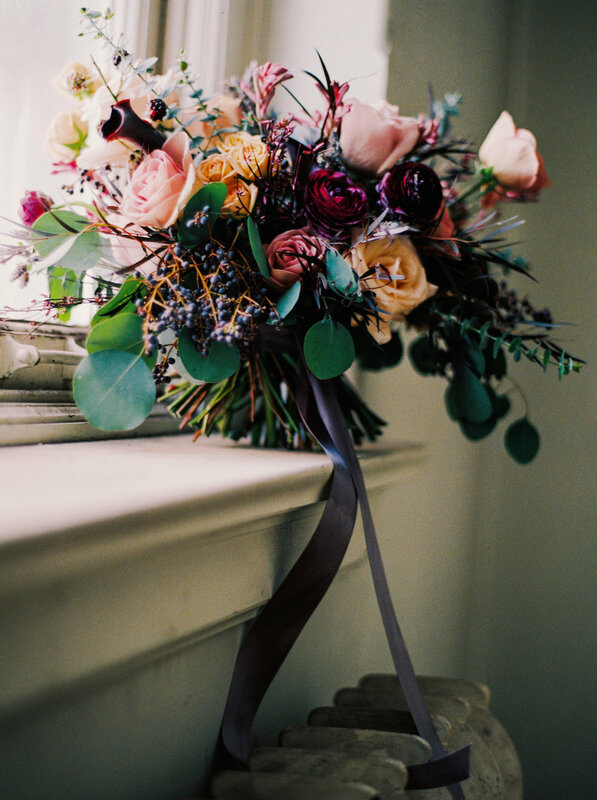 Oh and can we take a moment to admire the bouquet of my dreams from Beyond Flowers?? Our amazing hair and make up team from Made Beauty Co. (Velangeline and Charlene) gave Jensen a fresh, glowing look and hair that embraced her natural curl. Charlene actually pulled out an old school crimper to finish the look. Our groom model, Ari, is a stylist at Waltz on in Barber Shop so he took care of his own styling. This shoot makes me miss summer. 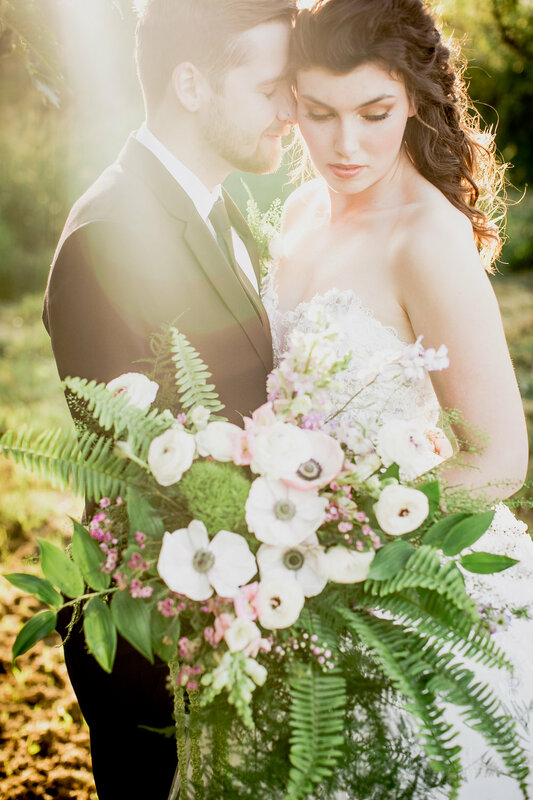 The beautiful golden light, lush flowers and shades of green. I really am a summer baby at heart. I’d love to hear what you have to say about our inspiration shoot. 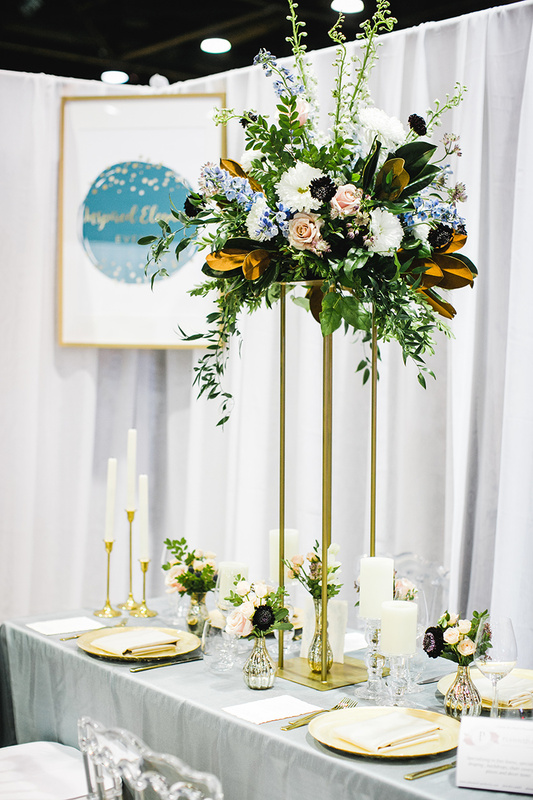 Credits to our all star group of vendors: Anna Lang Bridal, Beyond Flowers, Casey Nolin Photography, C&T Rentals, Dream Day Decorators, La Lune Event Venue, Made Beauty Co., The Vintage Nest for making my enchanted forest inspiration come true. This spring shoot kicked off my season and I couldn't be more excited about how it turned out. 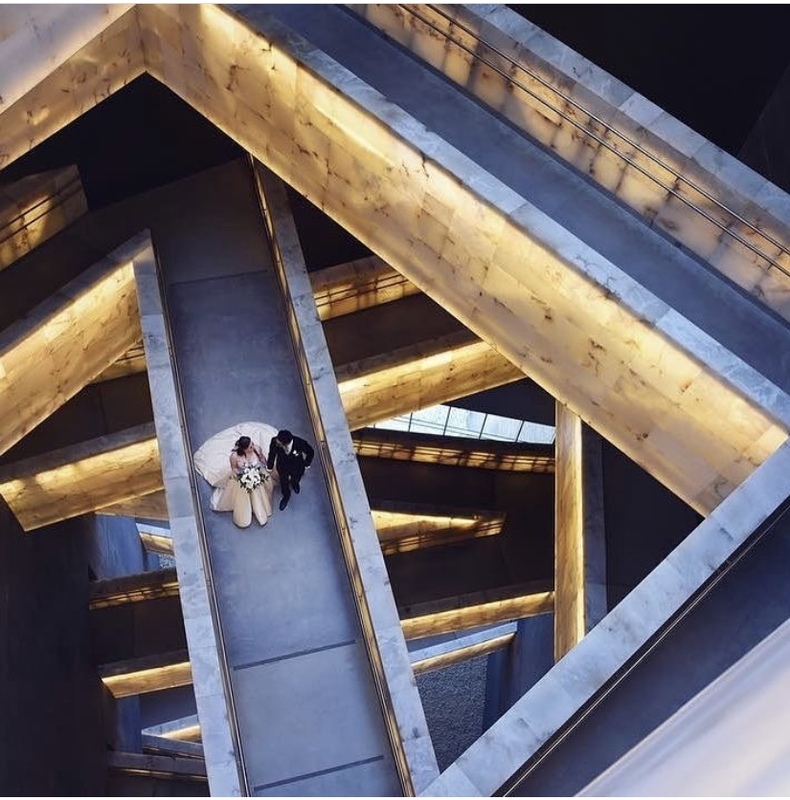 The venue was an old warehouse building in the heart of Winnipeg that used to be the Ogilvie Flour Mill. Casey Nolin Photography and I were thrilled about the space because we were the only people who've staged a shoot in the building. When Casey and I were planning the shoot we wanted to feature the fantastic pool of Winnipeg Wedding Vendors we have. From the Gatsby Gown by Anna Lang Bridal - designed locally, EPH Apparel's custom suit, Tallgrass' Vodka and Gin used in the creative cocktails supplied by Bees Knees Bar Services and the gorgeous white & green bouquet by Fauna & Fern, every piece came together perfectly. I love how it feels timeless and elegant in an effortless way. Plus it was amazing to see this shoot get picked up by both Love Inc. and Aisle Society! If you're planning a wedding and loving the way this came together we'd love to hear from you. Click on our Contact button to set up a your preliminary consultation. Hi! I'm Sheila, owner of Inspired Elegance Events. 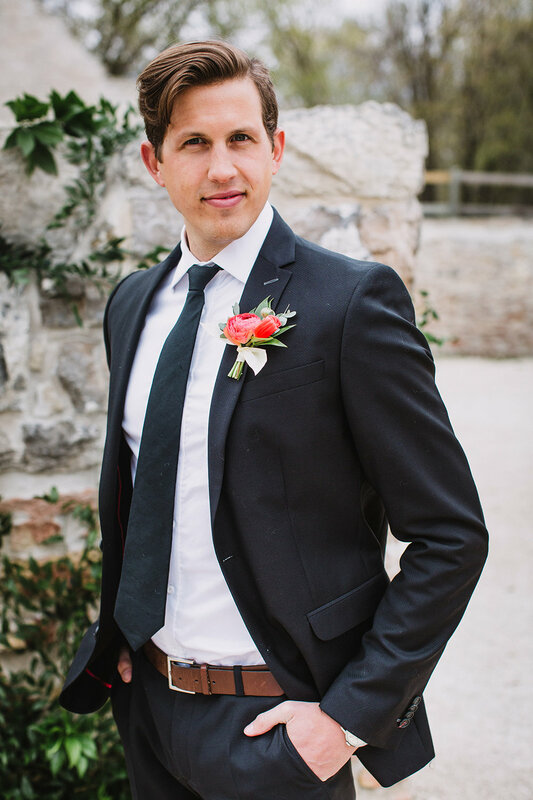 I have been working in the event management industry for nearly 10 years, beginning in Ottawa and now serving clients in Winnipeg for the past 8 years. 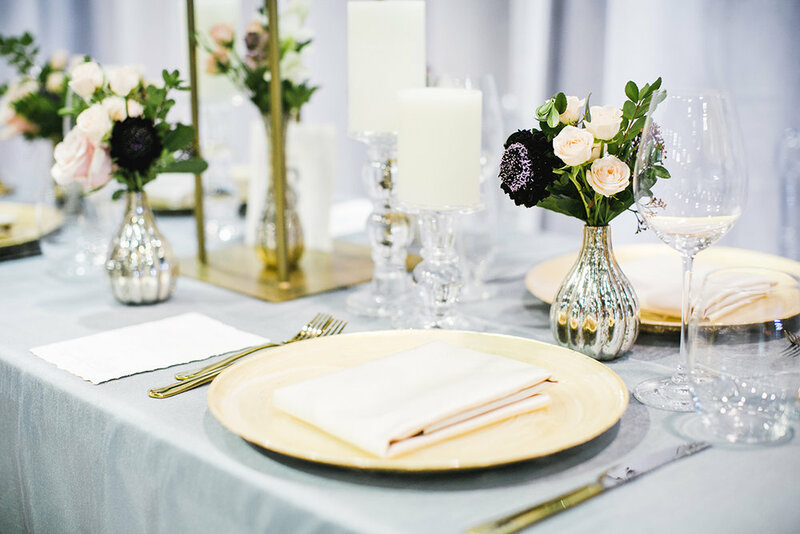 I worked as the Wedding & Events Coordinator for several of Winnipeg’s most well-respected, high end venues before establishing Inspired Elegance Events. 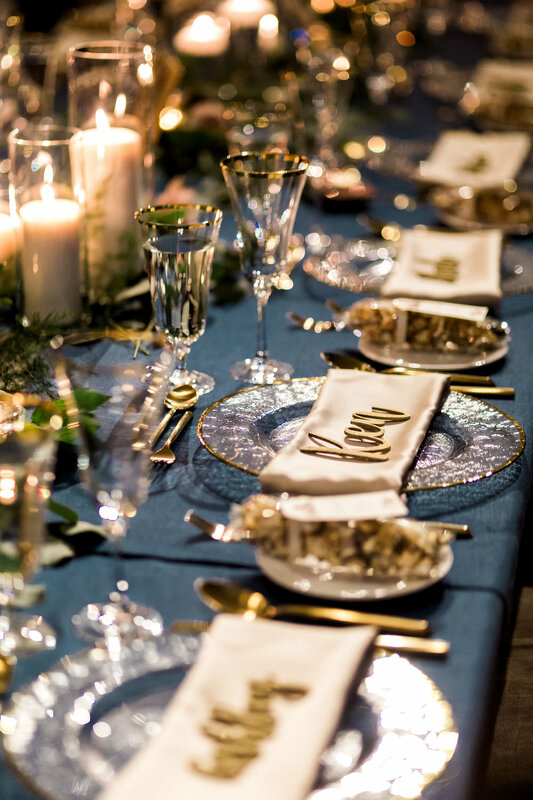 Having studied event management, I am also fully certified through the Wedding Planners Institute of Canada and educated through the Wine and Spirits Education Trust. I look forward to sharing my events and experience with you. Thanks for popping in! 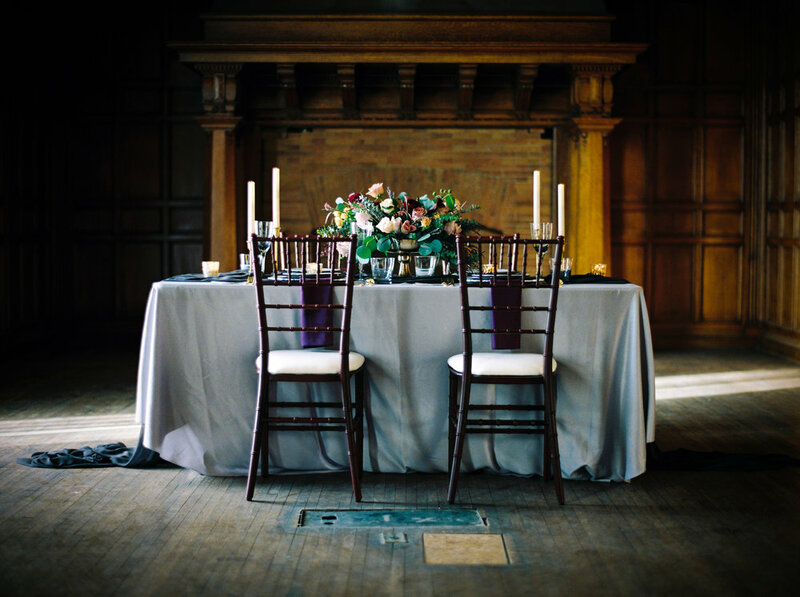 PLANNING A WEDDING OR SPECIAL EVENT? GET IN TOUCH ABOUT MY AVAILABILITY.